Weewoos and their main features. Weewoo, white Weewoo, grey Weewoo, plushie Weewoo, pink Weewoo, yellow Weewoo, blue Weewoo, green Weewoo, sketch Weewoo, mutant Weewoo, robot Weewoo, pirate Weewoo, disco Weewoo, Maraquan Weewoo, fire Weewoo, snow Weewoo, rainbow Weewoo, Christmas Weewoo and faerie Weewoo. Furthermore, we will analyze Weewoos according to their differences within their species; it is worth mentioning that most of the Weewoos behave in the same way more or less even though their colour or region may not be the same. To make their identification easier, we have divided them into six groups to be said next, with their place of origin. Group A: The most common Weewoos: pink, yellow, blue, green, rainbow, sketch and disco; they live mainly in Neopia Central and Kiko Lake; while the snow and Christmas Weewoos live in Terror Mountain. The fire Weewoos dwell in Mystery Island, the plushie ones in Roo Island, grays in Lost Desert and Haunted Woods. To close this group, pirate Weewoos live in Krawk Island. Group B: The faerie Weewoo which can be usually found in Faerieland. Group C: Mutant Weewoo, dwelling in the Haunted Woods. Group D: Maraquan Weewoo that lives in Maraqua. Group Z: Strange robot Weewoos that live in Virtupets. Last but not least, the white Weewoos. Even stranger than robot-coloured ones, they live only on the outside of the Neopian Times offices. For an unknown reason they have only been seen on those places and nearby and it is believed that they are the inspiration for many of the stories that are published afterwards. This white petpet does not belong to any group due to the lack of information that could be gathered from this species. As what we consider, they should be placed on group A because only their living place is what varies. Weewoos that belong to Group A: Their feathers vary depending on where they live, there are lots of tones, from light and vivid to opaque and without shine at all. These Weewoos are usually flying from one side to the other, gathering and taking food to their nest so as to raise their families. Their diet consists mainly of all kinds of neggs and some berries which are characteristic from their region. Their descents normally eat from their mother’s beak until they are two months old. During winter, all of them (except the plushie as they live on that zone) migrate for one month to Roo Island to collect the fruits that can only be gotten during that time of the year. It is estimated that Group A consists of 38,400 adult Weewoos, their reproduction is given when the females do a particular acute sound to the wind to which the males respond by flying towards them; immediately comes the dance when the females decide which males are apt and which ones are not. The eggs are incubated for a period around five or six days; after the birth, Weewoos remain in their nests for two more months until they are strong enough to learn to fly. All first-borned Weewoos lack of feathers on their body as they develop afterwards depending on their diet, what gives every species their particular colour are the different berries, special from each region. It is much questioned whether babies have wings or not, it is worth mentioning that if they do have they are not as long as other petpet’s. They are designed to fly long distances but at a very short speed, allowing them to reach any destiny without a significant waste of energy; all Weewoos travel in groups. These petpets live approximately seven years if they carry a good life, there are some Neopians who have captive Weewoos, what makes their life a bit longer and better (the longest living Weewoo was registered to have lived nine years! ); mind you, having these petpets in bad conditions is completely illegal. When Weewoos reach the age of two, they can be considered adults; they spend most of their time digging holes on the soil to sharpen their tiny claws. There are some Weewoos that, due to some genetically issues are born without their claws, what makes their life a bit harder. These birds like to sunbathe during the mornings as they love the first sunrays, recent studies have revealed that this makes their feathers shine even more, making them prettier. Weewoos are a pretty vain kind of petpet, they take three baths a day, and this sort of ritual consists on submerging quickly on any lagoon and then shake their wings to get dry with the sun’s help. To keep their feathers neat, they fly way high into the sky and then descend at an extreme speed, making every single feather properly combed. Weewoos communicate with each other with whistles that can vary depending on their mood: the happier they are, the more acute this whistle will be. On the other hand, a low sound is not a good sign as it shows inquiries or annoyance; they can modulate their sounds using different openings on their beaks. Their tail is half of their bodies’ length, this is pretty useful to keep balance and control while they fly; the snow Weewoo is a particular case, with a wooden tail that, on the opposites, makes this task even more difficult, this is why they spend most of their time on the ground. Weewoos belonging to Group B: The specie that belongs to Group B dwells in Faerieland, their whole nature is the same as the other Weewoos mentioned above but they do have a significant difference that allows them to have their own group. They have a magic way of reproduction, which also contains some science: very early, every first day of the month, Queen Fyora climbs to the top of the highest tower in Faerieland. Once there, she takes her wand and raises it until it touches the first sunray, pronouncing some mysterious words, she makes a shiny light come out of the wand and raises a few meters. After a few seconds, this light vanishes, resulting in a small pink and purple Weewoo egg. 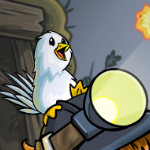 Fyora leaves this egg on the top of the tower for the sunrays to incubate it. On the sixth day, the baby comes out and is the only one who has its feathers at the time of its birth as a gift from the faeries. It is estimated that 138 individuals of faerie Weewoo, this is why it is in danger of extinction. Weewoos belonging to Group C: This specie has one single difference to the ones mentioned in Group A, and it is that it is considered a sort of artificial petpet because of the way it was created. Everything happened when a small group of green Weewoos were flying towards Roo Island, due to the strong winds they were deviated many kilometers from their destiny, what leaded them to the Haunted Woods. Desperate to get out of that place full of scary things, this group of petpets went to ask Edna for help, thinking that she was a nice witch. Edna, when she saw how weak and undefended they were, casted a spell for them not to ever leave the woods and, as a result, they become mutants. Their way of reproduction is much the same than those in Group A only that their whistle is horrible. There are 1,300 individuals. Weewoos belonging to Group D: This Weewoo is doubtless the most amazing from all Neopia, and not only because of its beauty, but also because of the mystery their creation keeps. Coming in green and blue tones, the Maraquan Weewoo has the perfect colour to camouflage among the waters from possible predators. Apart from the special colours, this species counts with a particular tail which is genetically different from the other Weewoos’; this allows them to swim at great speeds, reaching even 210 mph. Their diet consists on a great variety of algae which are selected carefully due to their extremely sensible stomach. Despite their weak intestines, this species has an amazing way to reproduce; it is the only Weewoo capable of having eggs without the need of a couple as they are formed when the petpet is in the right time and place. These eggs are formed inside the Weewoo and when they hatch, they need to be in a dry area for them not to drown. It is estimated that there are 2,800 individuals of this species. Weewoos belonging to Group Z: This species was left for the end deliberately as they are among the greatest rarity of petpets. The robot Weewoo is another artificial species such as the mutant ones but, as a difference, they were never natural. They way in which this kind of Weewoo was created is very controversial as there are lots of theories but the most accepted one is the Weewoo-sloth. It is said that Sloth, in a failed attempt to govern Neopia, sent to create some robots that looked like Weewoos to use them as part of his army. Sloth expected to be able to control these robots, but something unexpected happened: to create the eggs, DNA from white Weewoos was used; this made the robot Weewoos able to have their own soul, allowing them to ignore Sloth’s orders and, therefore, save Neopia from future annihilation. This Weewoos’ shape is much like the others though they lack of feathers and they fly thanks to some engines they have on their wings. It is also designed to swim at high speeds that can almost reach Maraquan Weewoos’. Their razor-shaped tail allows them to open up their way almost before any kind of object, leaving the robot Weewoo as the most dangerous of them all. Despite this, they are all kind-hearted and always willing to help other petpets, such a controversy for a soldier that was once created by Sloth. As regards their diet, this specie lacks of it as they need no food to survive; their artificial system is programmed to self-repair in case it gets broken. These petpets communicate with a particular system of sonic waves that they can only hear, but they also make another kind of sound to be able to communicate with the natural Weewoos. All in all they could be considered the perfect petpet but they have a single fault: since they are artificial machines, they cannot reproduce. 1,000 of this kind of Weewoos were created and activated though it is calculated that nowadays there are 900 of them. To sum up, Weewoos are a much loved kind of petpet, they come in many sizes, forms and shapes for every single Neopian to want them. They have to be well cared of, be nice to them and try to make their existence as long as possible in Neopia; otherwise they would end up being a species in danger of extinction and that would end up with a very valuable individual in Neopet’s ecosystem. All we can say is long life to Weewoos! Hopefully those little white Weewoos can keep on inspiring us to write more great stories for you, thank you so much for reading and happy 850th edition! !